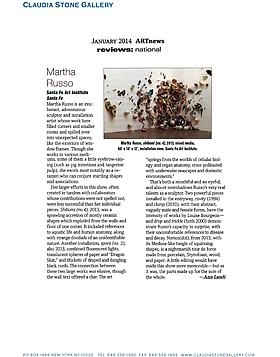 Martha Russo is an exuberant, adventurous sculptor and installation artist whose work here filled corners and smaller rooms and spilled over into unexpected spaces, like the exteriors of window frames. Though she works in various mediums, some of them a little eyebrow-raising (such as pig intestines and tangerine pulp), she excels most notably as a ceramist who can conjure startling shapes and associations. That’s both a mouthful and an eyeful, and almost overshadows Russo’s very real talents as a sculptor. Two powerful pieces installed in the entryway, cavity(1994) and clump (2010), with their abstract, vaguely male and female forms, have the intensity of works by Louise Bourgeois–and drop and trickle (both 2000), demonstrate Russo’s capacity to surprise, with their uncomfortable references to disease and decay. Nomos (dot), from 2013, with its Medusa-like tangle of squirming shapes, is a nightmarish tour de force made from porcelain, Styrofoam, wood, and paper. A little editing would have made this show more memorable–but as it was, the parts made up for the sum of the whole.